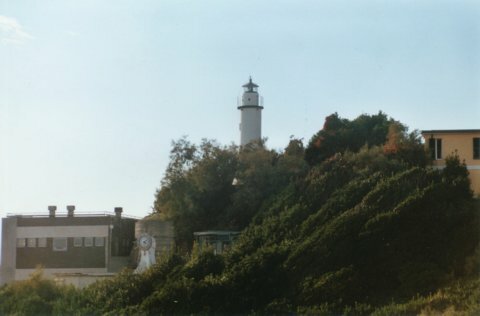 Punta VAGNO lighthouse:on a round white tower 9 mt tall.Group of 3 white flashes each 15 seconds,Range=18 n.miles. PUNTA VAGNO Lighthouse (44°23.5'N - 08°57'E) is a white cylindrical tower which is the main landmark for the harbour eastern entrance approach. Located east/southeast of the main harbor of Genova. From the maps it looks like you can get close to the lighthouse by taking SS1 east out of downtown Genova.